The tyres are the only contact between the vehicle and the road, so it is essential to keep them in good condition. You must comply with the local rules given in the highway code. They must: either have a load capacity and a speed capacity at least equal to the original tyres, or correspond to those recommended by your authorised dealer. 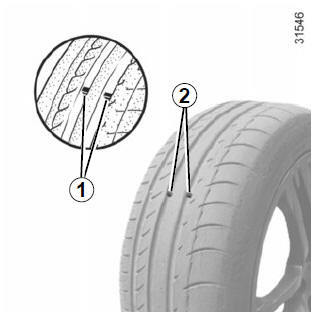 The tyres must be in good condition and the tread form must have sufficient depth; tyres approved by our Technical Department have wear warning strips 1 which are indicators moulded into the tread at several points. When the tyre tread has been worn to the level of the warning strips, they become visible 2: it is then necessary to replace your tyres because the tread rubber is now only 1.6 mm deep at most, resulting in poor road holding on wet roads. An overloaded vehicle, long journeys by motorway, particularly in very hot weather, or continual driving on poorly surfaced minor roads will lead to more rapid tyre wear and affect safety. Adhere to the tyre pressures (including the emergency spare wheel). The tyre pressures should be checked at least once a month and additionally before any long journey (refer to the label affixed to the edge of the driver’s door). lead to abnormal tyre wear and unusually hot running. risk of bursting or tread separation. The pressure depends on the load and the speed of use. Adjust the pressure according to the conditions of use (refer to the label affixed to the edge of the driver’s door). Pressures should be checked when the tyres are cold; ignore higher pressures which may be reached in hot weather or following a fast journey. If tyre pressures cannot be checked when the tyres are cold, assume an increase of 0.2 to 0.3 bar (or 3 PSI). the instrument panel comes on. See “Tyre pressure loss warning” in Section 2. Refer to the information on the “Emergency spare wheel” and instructions on “Changing a wheel” in Section 5. This practice is not recommended. For safety reasons, this operation must be carried out by a specialist. it may affect the use of snow chains. For safety reasons, fitting snow chains to the rear axle is strictly forbidden. Chains cannot be fitted to tyres which are larger than those originally fitted to the vehicle. Chains may only be fitted to tyres of the same size as those originally fitted to your vehicle. 18” wheels cannot be fitted with chains. If you wish to fit snow chains, you must use special equipment. We would recommend that these be fitted to all four wheels to ensure that your vehicle retains maximum adhesion. Warning: These tyres sometimes have a specific direction of rotation and a maximum speed index which may be lower than the maximum speed of your vehicle. This type of equipment may only be used for a limited period and as laid down by local legislation. It is necessary to observe the speed specified by current legislation. These tyres must, at a minimum, be fitted to the two front wheels. In all cases, we would recommend that you contact an approved dealer who will be able to advise you on the choice of equipment which is most suitable for your vehicle.